Thanks to all those who RSVPd for the banquet this Sunday, April 14! If you forgot to RSVP but would like to come, please send me your info quickly so I can get an accurate head count. If you have other events going on that day and are not sure whether you will make it on time, give me a heads up and we'll see what we can do. We will have some free play/game time before we eat and start the awards portion of the banquet. Note the Location Change to Scott A. Lewis Park! The pavilion location for the banquet has changed. Our pavilion is now at Scott E. Lewis Park (instead of Legacy Park). You can find Scott A. Lewis Park within the Miralago Subdivision off Mid Rivers Mall Drive at 1000 Scott A. Lewis Lane. Games such as wiffle ball, washers, corn hole, footballs, etc. Your wrestler's SINGLET if not already turned in. Singlet deposits are subject to forfeiture next week. Please don't forget to turn them in! If you aren't coming to the banquet, you will need to drop them off at FHC's main office to the attention of Coach Cross. Make sure your wrestler's name is attached. Unfortunately, due to problems finding an acceptable low-cost venue for our banquet, we are going to have to postpone it a couple of weeks. The new date is Sunday, April 14. We hope you'll join us at 4 p.m. at the Legacy Park pavilion in Cottleville. The club will provide meats and paper products, and we ask that each family provide a side dish or dessert, as well as their own drinks. You may also bring balls, wiffle bats, frisbees, or games for the kids to play. There are picnic tables at the pavilion, but you may also want to bring chairs for additional seating. All wrestlers will receive their participation certificates, and several special awards will be given, as well. 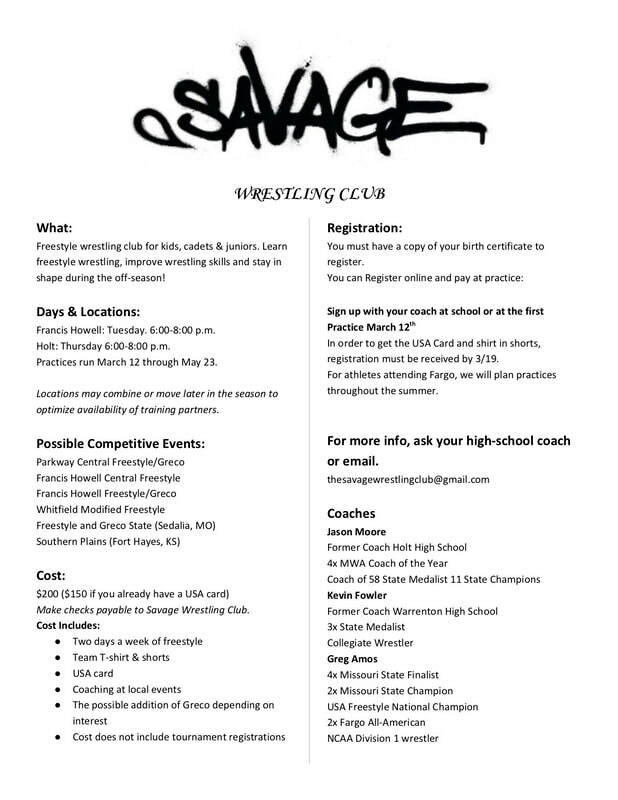 If any of our middle-schoolers have interest in learning and competing in freestyle and/or Greco-Roman wrestling styles this spring, attached is info on the Savage Wrestling Club, which is run by former Wentzville Holt HS coach Jason Moore and is intended for wrestlers from the Francis Howell and Wentzville school districts and surrounding areas. Practice begins tonight at Francis Howell, but wrestlers may join at another practice if they cannot make it tonight. Print out the registration form below and bring it with you to practice. We hope your wrestlers enjoyed this season and that they have grown as wrestlers and individuals. There will be opportunities for them to continue their development during the off-season, with camps this summer and other resources such as Purler Wrestling Academy. (Spartan wrestlers get a discount since we are a host facility.) Stay tuned for our camp schedule, as it is being finalized now. Camps for grades four and up will be published on the fhcsummercamps.com web site. We may be doing a smaller camp just for our younger wrestlers; we will let you know if and when that is scheduled. 1) During our USA state wrestling practice in the cafeteria this Thursday night, 6-8 p.m.
3) Dropping it off at the FHC main office, clearly marked with your wrestler's name, to the attention of Coach Cross by March 31. We are planning our year-end banquet for Sunday, March 31. We'll let you know the exact time and place as soon as we get it settled. Late afternoon or early evening is our goal. Come join the fun! All wrestlers will receive a participation certificate, and special award winners will also be recognized. Thanks for being a Spartan wrestling family this season, and best of luck to those Spartans competing in the Missouri USA State Tournament this weekend! 3) Jr. Spartan Miller Austin, who earned the AAU Triple Crown award by becoming champion at AAU State, the Missouri Challenge and the Ozark District tournament this season! Great way to represent, Spartans! If you haven't made a hotel reservation for Friday night after weigh-ins yet, don't delay. Rooms in Mexico fill up fast, but you can also stay in Kingdom City and have a little longer drive. If your son places in the top FOUR at regionals, he will qualify for the state tournament the following weekend in Kansas City. If this is the case, please find Julie Graham in the stands and pay her the $35 entry fee for the state tournament AND order/pay for state T-shirts if desired BEFORE LEAVING. Note that all wrestlers must weigh in and show up ready to wrestle even if they have four or fewer wrestlers in their brackets in order to advance to the state tournament. It is a good idea to make a tentative hotel reservation just in case if you haven't already. Some of the team are staying at the Homewood Suites near the airport, but there are plenty of places to choose from. You can find the state tournament flier by searching Trackwrestling for 2019 Missouri USA State Wrestling Tournament. Just a reminder that I will be at FHC from 6 to 7 p.m. Tuesday, Feb. 26 for singlet turn-ins. Please make sure all singlets are clean before turning in. It's been a great season, Spartans! Stay tuned for information on our year-end banquet and summer camps! ​It's been a bit of a crazy season, with the weather causing cancellations and the shortening of the season by a bit, but let's go out with a bang! This will be the last week of practice for those not participating in the USA series. If I owe you a refund for the Pattonville tournament, please see me before practice Tuesday. The seeding meeting for AAU State is Wednesday at 7 p.m. at St. Charles West HS. This may be a conflict with the USA districts seeding meeting if it gets rescheduled for the same night, so we likely will need more parents than usual to help out by attending the meeting. Note: Only wrestlers in the Blue division are seeded. PLEASE EMAIL ME IF YOU ARE PLANNING TO ATTEND THIS MEETING. Parents of Blue division wrestlers should email their sons' match records to spartanwrestlingclubmo@gmail.com by noon Wednesday so they can be distributed to those attending the meeting. This must include date, tournament, opponent name and result. It is not necessary for Gold division parents to attend or send records. All wrestlers in both divisions must attend weigh-ins. There are weigh-in options on Friday, Saturday and Sunday. Refer to the flier for the exact schedule. Blue wrestlers must make the weight they signed up for. Gold wrestlers will be moved to the next weight class if they do not make scratch weight for the weight they registered. Wrestlers who are also competing in USA Districts may count that weight for the AAU tournament IF they email MissouriAAUState@gmail.com and provide their name, age division and weight class and inform them that they wish to use their USA District weigh-in. We will have singlet turn-in night for those Spartans who are finished competing for the year on Tuesday, Feb. 26 from 6 to 7 p.m. Your deposit will be returned to you at that time. If your son is still competing, keep the singlet until after USA State. We will do another turn-in night then or collect them at the banquet. Good luck to all our Spartans this weekend! If you're receiving this email, then your son is registered to participate in the USA Wrestling MO District 8 Tournament this Saturday, Feb. 23 at Seckman High School. Even if you've been through the USA series before, please read thoroughly so you are not confused about any changes for this year. The seeding meeting will be held at 7 p.m. Tuesday at Seckman High School. Please send your son's match record (including date, tournament, competitor name, result (W/L), weight) to spartanwrestlingclubmo@gmail.com no later than noon Tuesday so it can be sent with the parents who will represent the Spartans at the tournament. If you are planning to attend, please let me know if you haven't already so I can make sure we have coverage for all age levels. Criteria for seeding include head-to-head record with other competitors in the bracket, results vs common competitors, competition level, and overall season record. If your son has or is recovering from an active skin infection that may still be visible by weigh-ins, you will need to obtain a signed skin form (attached) that states the skin infection has been treated and is no longer contagious. This must be completed by a physician the required number of days in advance, so review it thoroughly if your son has an infection and bring the form to weigh-ins. Wrestlers who have signs of infection and no skin form are not allowed to compete. Weigh-ins will be held Friday night 6:30-8 p.m. at Seckman HS OR Saturday morning 7:30-8 a.m.
Any wrestler who doesn't make weight Friday night may weigh again Saturday morning. EVERYONE MUST WEIGH IN ON SITE WITHOUT EXCEPTION. AAU State will accept your son's weigh-in result from USA Districts, but they want to be notified in advance that you plan to use your weigh-in from districts. Send your son's name, age division and AAU weight class registered for to: MissouriAAUState@gmail.com to let them know you plan to use your district weigh-in. Anyone who has been to Seckman before knows it is like 1992 all over again; it is nearly impossible to get a phone signal there, and they usually have no guest wifi availability either. Therefore, it is advisable for you to visit the tournament on trackwrestling.com (enter District 8 in the search and you'll find it easily) before you go and print out or screenshot all info related to your son's bracket and mat assignments so you'll have it handy no matter what. The top six wrestlers in each bracket qualify to compete at the Region D tournament the following Saturday in Mexico, Mo. If your son qualifies, you MUST find me BEFORE LEAVING to register for Regionals and pay the $20 fee. I will be in the 14U gym, which will be good to know since you likely won't be able to reach me on my phone. If you end up going to regionals and decide to stay Friday night in a hotel, some of us will be staying at the Best Western -Teal Lake in Mexico if you'd like to stay at the same place. The same rules apply for everyone regardless of the size of the bracket. Therefore, if your son is going to automatically qualify for regionals due to there being six or fewer wrestlers in his bracket, he still has to show up, weigh in, and be ready to wrestle. The $20 fee still applies even if he doesn't get to wrestle (hopefully, that will not be the case). After this week, practices will be limited to those wrestlers competing in the USA series, so you will notice smaller numbers. Our coaches will be working hard to get them ready for competition! If your son does not end up qualifying for regionals, he is still welcome to continue practicing with the rest of the group up until the state tournament. Best of luck to all of our guys! We know they'll represent the Spartans well! Last chance to sign up for USA Districts, the first step in the USA State series! I'm resending this information to remind everyone that the deadline to extend the wrestling season and compete for a USA district, regional, and state championship is upon us! The USA District 8 Tournament will be held at Seckman High School on Feb. 23. The district tournament is the first step in the USA State series. Wrestlers who place in the top six at the district tournament qualify to compete at the USA Region D Tournament the following weekend, March 2, in Mexico, Mo. The top four placers at regionals will qualify to compete at the USA Missouri State Championship Tournament in Kansas City on March 8-10. I must have all entries NO LATER than 8 p.m., Thursday, Feb. 14. If you decide you'd like to change a weight class, let me know before Feb. 16 and I will make the change to our registration. No late registrations are allowed after Feb. 16. Please understand that, after Feb. 16, there is a $20 fee to change a weight class. No further changes may be made to weight classes after 7 p.m., Feb. 19 (at the seeding meeting). The individual must commit to the same weight class for the duration of the series (districts, regionals, state). In addition, do not register for districts if you do not plan on attending regionals and state if your wrestler qualifies. To view the District 8 flier, visit www.trackwrestling.com. Click Browse, then Tournaments, then Search Events. If you type District 8 into the event name field and search, you will find it easily. When the tournament comes up, Click on More Info and Event Flyer. The flier will come up. You can also find it on our web site from the calendar (the link doesn't seem to work correctly when I copy and paste it). Note, the USA State Series is open to wrestlers in the 8U, 10U, 12U and 14U age divisions. Six-and-under wrestlers are not eligible. So, this means no wrestlers born after 2011 may compete. The registration envelope will be available in the board through Thursday this week, and feel free to respond with any questions. Although this tournament is called the Fox tournament, if you looked closely at the flier (I admittedly did not at first), you will see that it is being held at SECKMAN HIGH SCHOOL this year instead of Fox High School. Please make sure you know where you're going! FYI - Seckman sits in a valley and is notorious for having virtually NO cell service within its walls, so be prepared for that. I'm sure it was a disappointment to many that the Pattonville tournament was canceled Sunday. It is highly doubtful that they will reschedule it, so I will be issuing refunds to those of you who registered (unless we have already made other arrangements). Please see me before practice Tuesday or Thursday and I'll return your checks/cash to you. I won't be at Minis practice Wednesday, but I will get theirs to one of the coaches to hand out. Separately, I've sent information on both the AAU State and USA District 8 tournaments via email. If you have questions, please do not hesitate to reach out. We'd love to see as many Spartans as possible participate! We will likely have many Spartans doing both. Both AAU State and USA Districts will hold seeding meetings, and we will need parents to volunteer to attend the meetings on behalf of each age division. If you are willing, please let me know. I will likely need your help to gather the seeding info from parents. For those not competing in the USA series (districts, regionals, state), the season will conclude with the AAU State Tournament on Feb. 23-24. Those who are competing in the USA series will continue practicing through March 7. We will plan a post-season banquet for everyone soon, and details will be forthcoming. For the past several years, we have had a separate banquet for the Mini-Spartans due to the earlier ending of their season. With the USA series being bumped up by several weeks this year, however, we will likely bring everyone together once again. We hope all of you will join in the celebration at that time. Thanks all! Let's finish the season strong, Spartans! See the attachment below to view the flier for the USA District 8 Tournament, to be held at Seckman High School on Feb. 23. The district tournament is the first step in the USA State series. Wrestlers who place in the top six at the district tournament qualify to compete at the USA Region D Tournament the following weekend, March 2, in Mexico, Mo. The top four placers at regionals will qualify to compete at the USA Missouri State Championship Tournament in Kansas City on March 9-10. The Spartans have a history of great performance at the USA State Tournament, and this year should be no exception! Although the deadline to register for the District 8 Tournament is not for a couple of weeks (Feb. 14 at practice), please let us know if your child is planning to compete in the tournament for the first time this year. All participants must have USA competition cards, and we will need to make sure we secure those before registering our club members. Note, the USA State Series is open to wrestlers in the 8U, 10U, 12U and 14U age divisions. Six-and-under wrestlers are not eligible (they have their own separate tournament, which is actually in Sedalia this weekend). So, this means no wrestlers born after 2011 may compete. The registration envelope will be available in the board this week, and feel free to respond with any questions.